Looking for a car diagnostic test near West Covina? Johnny’s Auto Service can help. There’re multiple options when you’re looking for a “car diagnostics test near me”. 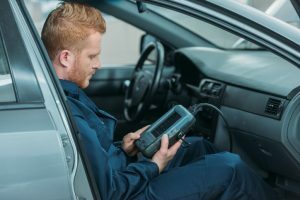 Sometimes drivers believe all you need is an electric code reader that you can purchase at any auto care store. Unfortunately, the code reader never tells you the direct problem on its own. The code reader only reads one computer for the engine. Most cars have 7-10 computers in them, and a code reader does not read any of those 7-10 computers. A code reader is much like going to the doctor to get an MRI or X-RAY. Anyone can do an MRI or X-RAY but it takes an expert to determine what the results are from those scans. An example would be when a code reader says there is a fault code for an oxygen sensor. Surprisingly, it is common that the oxygen sensor is not the actual problem, so it takes an expert to interpret what the scan computer is telling them. You can buy a general code reader at the parts store for $40-$50 dollars. The car diagnostic test equipment that we have is manufacturer specific for Ford and GM vehicles. These machines that we utilize to diagnose your vehicle run from $10,000 to $15,000 apiece. Just like your computer or phone must get software updates, so do ours! We are always updating to the latest and greatest. Unfortunately, a general code reader from the auto parts store cannot update in this way. Johnny’s Auto Service is happy to help with any car diagnostic test needs you might have near West Covina. Whether it is a check engine light, or your vehicle is idling rough, or any other problem, we have the certified technician to take care of the issue and get you back on the road safely and quickly. When you’re looking for “car diagnostics test near me”, give Johnny’s Auto Service a ring.